We do not need an explanation for the excitement that Christmas brings to us every year. That is when we get time to spend a vacation with our family and friends. As the days of Advent season goes by the preparations for the celebration kick start. 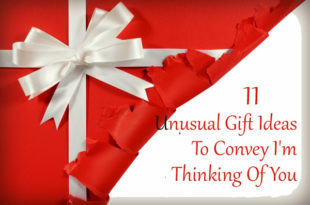 Even though we can place orders online, Christmas shopping is considered as a tradition. We often tend to forget about the furry canine friends we have while planning for Christmas shopping. 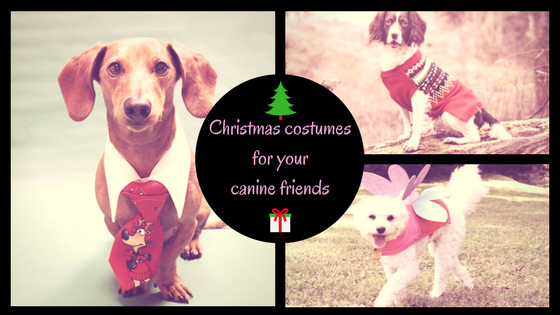 This article is about dog Christmas costumes like dog jumpers to help you with selecting the best for your pet. The first costume on the list is a reindeer holiday sweater for your dog. This double knitted sweater is made of soft and warm acrylic yarn for the comfort of your pet. The colors present on this sweater are white, black, maroon, and light brown. The sweater has a reindeer knitted onto it at the back. Your dog will look cute in this and this will also keep it warm in the winter season. Get your pet ready with this reindeer dog sweater this year for Christmas party. Another accessory that you can buy for your canine friend is a dog collar. The collar is made of nylon and is 1-inch wide. You can measure the collar size for your dog and send it while placing the order. This is a lovely accessory to have when you go shopping for pet Christmas sweaters or jumpers. The D-ring on the collar makes it easy to connect the leash. The seller of this particular product even gives you the option to select the color; however, the default colors are red and white. One of the main characters in the story of Christmas is Santa and we can buy dog Christmas costumes like Santa. 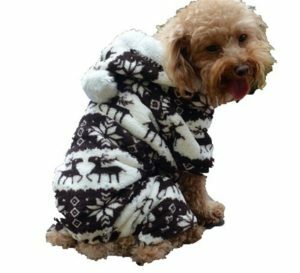 This cute reindeer holiday sweater will make your pet look more adorable and it is comfortable for your pet in the winter season. The materials used are cotton and chemical fiber. The color is red as it is in Santa’s cloth. This is a custom made dog Christmas sweater so you have to select the correct measurement while placing the order. SUGGESTED READ Assortments of Christmas Train Set for Your Child This Christmas! 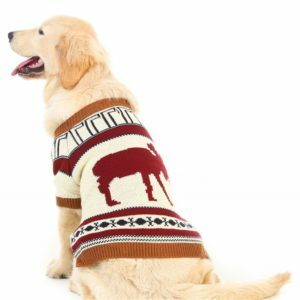 A hand knitted dog Christmas sweater is another option you have while selecting dog Christmas costumes. 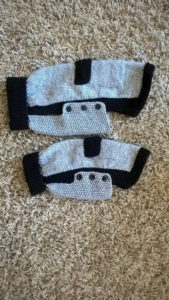 I have included these dog jumpers that are made of good quality yarn. The advantage of this jumper is that you have a pocket to keep the poop bags when you take your pet for walks. You should select the size while ordering for this dog Christmas sweater. Even though the product in the link is a mix of grey and black color you can order for the desired color. 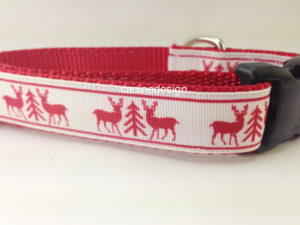 We already mentioned about a typical Christmas dog collar above. But here I am talking about a holiday collar with a bow in the front. This one will be ideal for smaller breeds like Pomeranian. The colors used here are red, green, and dark brown. This type of collars also comes with a detachable pom pom or Christmas ornaments like baubles other than bows. 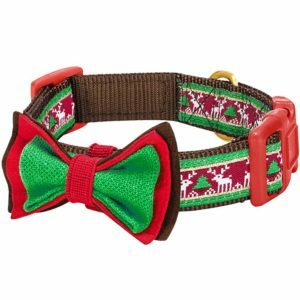 To give this collar a festive look, the seller has a detachable bell décor attached to it. Even though these are “dog magnets” they are gifts for the pet owners. These are like the fridge magnets we keep on our refrigerator door. 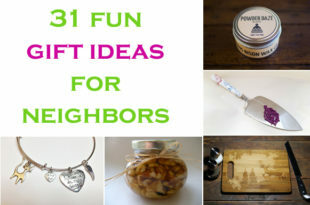 The theme for these magnets is pet Christmas sweaters. 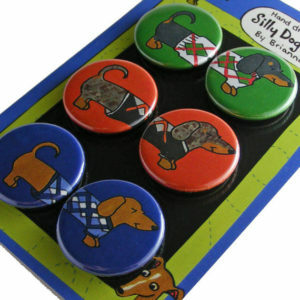 These Dachshunds dog magnets are the perfect gifts for dog lovers and dog owners. These are handmade from scratch. 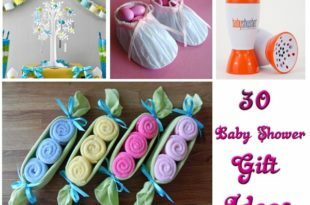 You can buy anything similar to these and gift wrap for the person as a Christmas present. Well, this is indeed considered as one of the dog Christmas costumes. But the difference is that the costume set has a matching pajama for the owner too. 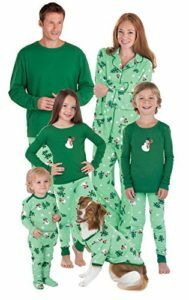 This family pajama set gives you an option to order for everyone in the family including your dog. The only thing you have to do is select the size differently for each member of the family. Here you can order the pajama for your pet also. On this year’s Christmas buy your furry friend a pajama matching to your costume. 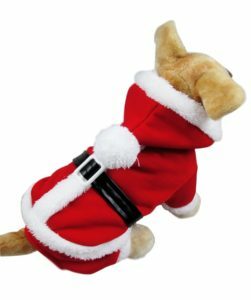 The next one on the list of holiday costumes for dogs is a Santa dog scarf that has “I love (heart shape) SANTA” sewn on it. This will be a great addition to the reindeer holiday sweater you have bought (if you have not bought yet, buy it this year). You can tie this scarf around the dog’s neck to keep it warm in the winter season. The materials used for this handmade dog scarf are acrylic yarn, pom pom, and jewel embellishments. You can use this on your cat too to give a stylish look to the pet Christmas sweaters. Do not get confused with the name jumpers. Here I am not talking about the sweater. This is a snack chamber for dogs and cats. You can keep a tasty snack inside this chamber so that your pet can chew to break it open. This will give a good exercise for their facial bones and teeth. 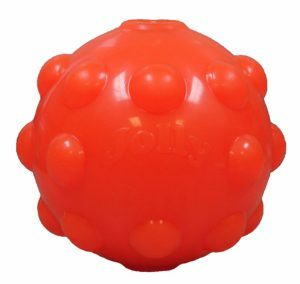 This can be the Christmas gift for your dog because these are bouncy and dogs like playing with bouncing balls like this. You add snack so that your pet will be attracted and motivated to play. Who said that only human beings can wear pendants and chains? 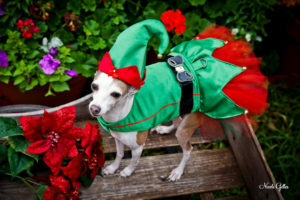 Even our pets deserve a nice outfit and accessory for this Christmas. Next is a reindeer pendant charm that can be worn with any reindeer dog sweater. 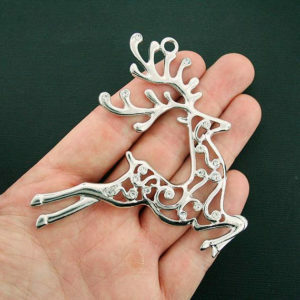 This reindeer pendant is made of zinc alloy metal and is toned to look like silver. Even though the product says this is for kids we can let our cute dog wear this with the collar. 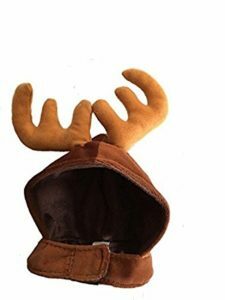 If you are wondering which accessory you should use with your pet’s dog Christmas sweater the answer is an antler hat. The hat that is mentioned here is made of brown colored soft plush material so that it will not disturb your dog’s skin. This is the best choice for dog Christmas costumes along with the reindeer holiday sweater. The Velcro closure below the neck makes it easy to attach and detach. Before talking about this particular costume let me explain what is Bandana. Bandana is a large handkerchief that is tied around your neck. Not only humans even their pets wear bandanas. 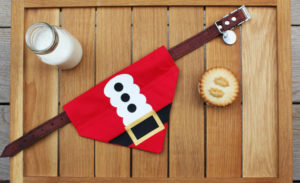 For this year’s Christmas dress your dog like a Santa with a beautiful Santa dog Bandana. 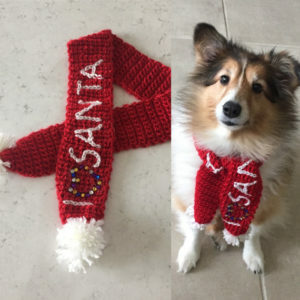 This can be worn along with the pet Christmas sweaters that’s has the same design as Santa’s coat (in red and white color). This piece is stitched with an opening so that the dog’s collar belt can pass through. 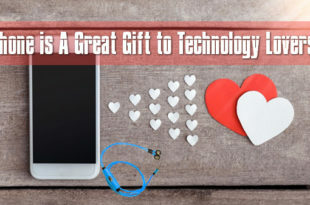 SUGGESTED READ 10 Brilliant Gifts for 3 Year Old Boys That You Must See! A jumper for your canine friend is the best way to dress it for Christmas party. The dog jumper mentioned here has a gentleman look for it with a bow and suspenders like in 19th-century pants. The jumper in this link is made of soft cloth with brown pants and blue shirt. There is a black bow stitched to the neck of the blue shirt to give it a party look. 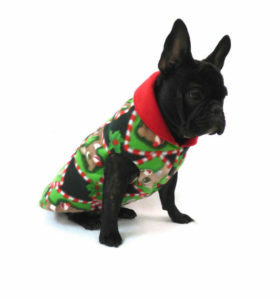 You can let your dog wear this if you are taking your pet for the Christmas party. We already saw one of the reindeer dog sweaters in the beginning. Next, we are going to talk about a dog costume that looks like an elf dress. The dress is made of green satin cloth, tutu skirt, and D-ring to connect the leash. With the dress, there is a beautiful elf hat of green and red color. This is one of the cutest dog Christmas costumes I have ever seen online. The next one is a dog Christmas sweater that resembles the snow deer. 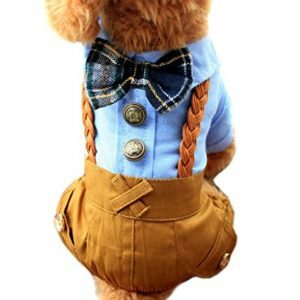 This is made of a thick but soft material to make it comfortable your cute puppy. But let me remind you that this is only for puppies and smaller breeds. This is one of the pet Christmas sweaters that even have a hoodie that resembles Santa’s hat with a pom pom at the end. This is different from the other sweaters because it has four legs unlike the other costumes in the market. The last one on this list of Christmas costumes for your pet is a reindeer dog sweater that has Rudolf the reindeer’s picture on it. Rudolf is a reindeer with a glowing red nose and is considered as “Santa’s ninth reindeer”. This pullover made of fleece gives the comfort needed during the winter season. This product is available in three sizes and comes with a standout collar in contrast color.